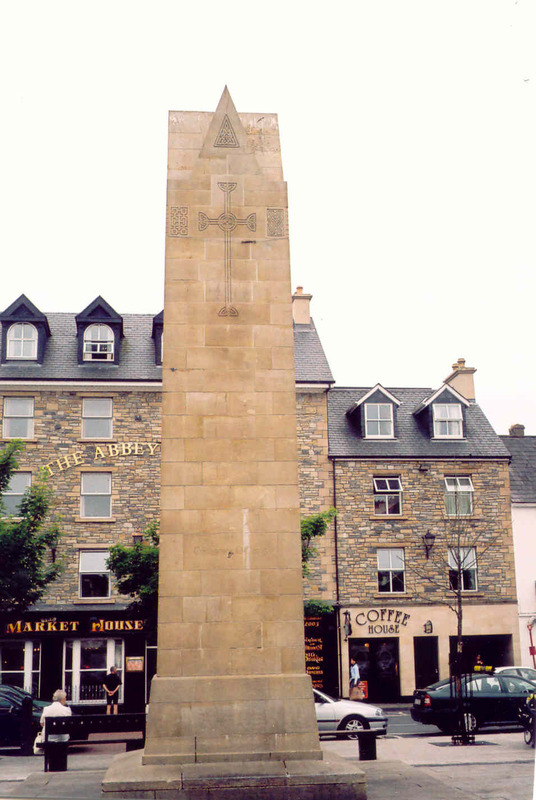 A monument to the Four Masters was erected on the Donegal Town diamond in 1937. 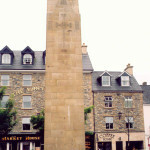 The 20 foot high obelisk honors the four principal authors of the “Annals of the Kingdom of Ireland,” an epic history of Ireland from the time of the great flood (in Genesis) to 1616 AD. The authors began their work on the Annals in 1632 when it was clear that English culture would dominate Ireland following England’s victory in 1603 over the Irish, and the Gaelic way of life could vanish from memory. The main author of the Annals was Michael O’Clery (O’Cleirigh), a Franciscan friar. Under the patronage of Fergal O’Gara of County Sligo, Brother Michael collected many medieval annals, and he assembled three other authors who were also expert antiquarians. Together they gathered in a convent on the outskirts of Donegal Town. (Many believe that the Annals were written in the Franciscan Abby in Donegal Town, but the abby had been destroyed by the English in 1601.) The four proceeded to document the history of the country on a year by year basis. Many other authors contributed to the Annals, but the principal writers were: Michael O’Clery, Farfassa O’Mulconry ( Fearfeasa O Maol Chonaire), Peregrine O’Clery (Cu Coigriche O Cleirigh), and Peregrine O’Duignan (Cu Coigriche O Duibhgeannain). Michael O’Clery and O’Duignan were Franciscans; the other two were laymen. Peregrine O’Clery was a distant cousin of Michael O‘Clery. The Annals were written in Irish and completed in 1636. The descriptions of ancient times are brief, listing mostly births and deaths. Later “mythological” legends of early invasions, battles, and occupation of Ireland by the Formorians, Firbolgs, De Dananns, and Milesians are described. The annals list the Kings of Ireland and their battles in each year. The year 379 AD shows the first year reign of Niall of the Seven Hostages. The year 432 AD shows St. Patrick returning to Ireland to convert the pagans. As the years progress, more and more detail is provided about the clerics, kings, and wars between chieftains. The war with England in the 16th century is well documented, as well as the defeat of the Irish Earls at Kinsale in 1601.